The North American Computational Linguistics Olympiad is coming to Oregon State University on January 26, 2017! While no prior knowledge is necessary, the best practice is to do old Linguistics Olympiad puzzles! You can find hundreds of previous-years' puzzles at NACLO and the International Linguistics Olympiad. Check-in: 8:15 to 8:30 A.M.
Students take their seats: 8:30 to 8:40 A.M. Welcome and review of rules: 8:40 to 9:00 A.M. Exam period: 9:00 A.M to 12:00 P.M. The NACLO Open Round exam will take place at the Kelley Engineering Center (KEC), 2500 NW Monroe Ave, Corvallis, in Conference Room 2057. 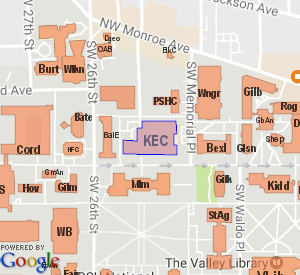 The KEC building (which hosts the School of EECS) is located on the north side of the OSU campus, just south of Monroe Ave and 25th Street. Room 2057 is on the second floor, the north side. The top-performing students in the Open Round will be invited to participate in the Invitational Round on March 10th. Because NACLO is a nationwide exam, we must adhere to the test schedule and test with the eastern time zone on January 28. Therefore, in the event of any school closings or delays, NACLO will proceed as scheduled. Unfortunately, we will not be able to offer a make-up day for those students who were unable to make it to Carnegie Mellon in time for the exam. This website is modeled after NACLO @ CMU.